American tabloid Globe claims the President’s mysterious father was murdered in Kenya. Barack’s sister reportedly makes the allegations in a chilling new book.”MythBusters”: His father was not killed in a car accident in 1982, as was reported, but was murdered. So goes a family theory investigated by Peter Firstbrook in his history of President Barack Obama’s African side of the family, “The Obamas,” and dissected by Obama biographer David Remnick in a post today on the New Yorker’s website. Barack Obama’s extended family paints a colorful picture, and it’s one he’d probably prefer you not see. Attempting to research his family, including all his father’s wives and mistresses, and all his half-siblings, Obama shares a father with seven half-siblings, and a mother with one. Barack Obama, Sr. was married to at least three women, always 2 at a time, and fathered eight children with four different women. When Barack Sr. left Kenya for Hawaii, where he met Barack Jr.’s mother Ann, he left behind a wife named Kezia, whom he married in a local tribal ceremony at age 18. They had a son named Abongo (also known as Roy or Malik), born in 1958, and at the time he left for Hawaii, Kezia was pregnant with Auma, the senior Obama’s only daughter. She was born in 1960, just the year before Ann Dunham gave birth to Barack Obama, Jr., in Hawaii. During his time at Harvard, while black wife Kezia and children Roy and Auma lived in Kenya, and white wife Ann and son Barack lived in Hawaii, the senior Obama began a relationship with a Harvard classmate, Ruth Nidesand, a white American school teacher. We have heard very little mention of Ruth, who now runs a kindergarten in Nairobi. Ruth followed Obama Sr. back to Kenya after he received his degree from Harvard. There, they eventually married and lived the affluent life of a government bureaucrat (he was an economist for the Ministry of Finance) in Nairobi. They had two sons, Mark (1964), and David, before being divorced amid whispered rumors that Barack Sr. was an abusive alcoholic who routinely came home inebriated, and brutally beat his wife. Ruth remarried and her sons took their stepfather’s name, Ndesandjo, which is strangely similar to their mother’s maiden name. David was killed in a motorcycle accident. The senior Obama, despite living in other places with other wives, kept returning to Kezia throughout his life. They had a son named Abo born in 1968, and another son named Bernard, born in 1970. 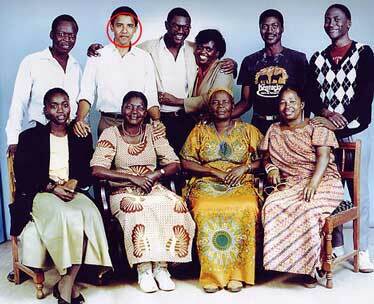 The youngest Obama son, George, was born to the fourth woman, Jael, in Nairobi. It is reported that Barack Sr. was planning to marry her at the time of his death. (Apparently polygamy was common in Africa.) George, only six months old when his father died, lives today in a corrugated tin shack in the slums of Nairobi and reportedly gets by on $1 a day. Barack Obama and Mark Ndesandjo have very different views of their father. Barack Obama has a romanticized, larger-than-life and largely fantasized view of his absent father, while Mark remembers an all-too-real abusive alcoholic who made life rough for his wife and children. His alcohol problems contributed to the decline of his government career, and the humiliation of losing his job contributed to his drinking problem. Kezia, who now lives outside London, says she first learned about Ruth when Obama Sr. was injured in a car wreck in 1981 (the year before the accident that killed him) and his injuries were severe enough to require the amputation of both legs. She arrived in Nairobi to visit him in the hospital, and wondered who the white woman was she saw in her husband’s room. That’s when the elder Barack introduced her to his third wife and told her they had two children. Apparently that was the first time either woman knew about the other. Barack Obama Sr. was “a thwarted politician and bureaucrat,” outspoken in his criticism of the Kenyan government’s acceptance of corruption among its ranks, according to Remnick. He was also a heavy drinker, nicknamed “Mr. Double-Double” after his usual Scotch orders. On the night of his death he was found inside his car, which had hit a tree. Firstbrook talked to Charles Oluoch, a cousin of the president, who related the family’s suspicions. Obama Sr. had been in a number of accidents before and had survived them all. His body appeared to be fairly unharmed — no broken bones and only a small amount of blood. Hey there I am so excited I found your website, I really found you by error, while I was searching on Aol for something else, Anyways I am here now and would just like to say many thanks for a tremendous post and a all round exciting blog (I also love the theme/design), I don’t have time to look over it all at the minute but I have saved it and also added your RSS feeds, so when I have time I will be back to read more, Please do keep up the great work.